Many flights arrive at Lima airport (LIM) at night and the airport is located in one of the not-so-safe area of the city, called Callao. Taxis are abundant outside the airport but don’t go with anyone asking for a taxi. Check in with the information center and they will assign an “official” taxi to you which is reliable and safe. Taxis usually cost anything between PEN 70 (approx $22) to PEN 90 (approx $27) to Miraflores area. Now, a new bus service is set to change this. 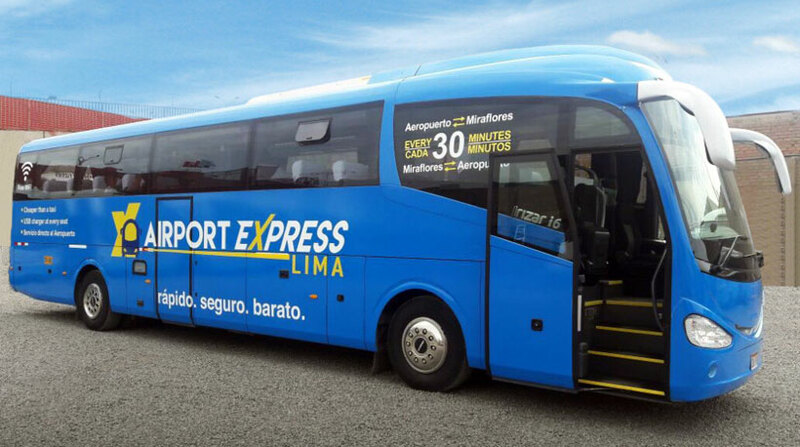 Starting March 26, 2017, Airport Express Lima will run luxury, air-conditioned buses 24 hours a day, every 30 minutes from the airport to Miraflores area and back. Online – Book your bus tickets on their website. Domestic Arrivals: At the baggage reclaim area, you will see “Airport Express Lima” stand which is situated in the ground transport zone close to the exit. On the bus – Worried about using your credit card online? You can make a payment on the bus itself. They have an English-speaking driver who will accept cash in USD and PEN, making it really easy for anyone who did not book online or at the airport. The best part is that you’re not bound to the bus you paid for. You can always hop on the next bus if you missed the one you booked. Safety concerns? A GPS monitoring system tracks all buses every step of the way and monitor driver speed. This is definitely a great option for travelers going to the city. Of course, there’s a cheaper option of taking the public bus (costing PEN 2), which requires you to walk to the main road and wait for the public bus IM-18, that takes about 1.5 hours to 2 hours. But ‘Airport Express Lima’ sure is a better and cheaper option.